Media Matters analyzed television news guests who discussed the Environmental Protection Agency's role in regulating greenhouse gas emissions from December 2009 through April 2011. Driven largely by Fox News Channel and Fox Business Network, results show that in 76 percent of those appearances, the guest was opposed to EPA regulations while 18 percent were in favor. Of the appearances by elected officials, 86 percent were Republican. Only one guest in 17 months of coverage across nine news outlets was a climate scientist -- industry-funded Patrick Michaels. Responding to a lawsuit brought by states, cities, and advocacy groups, the Supreme Court ruled on April 2, 2007, that the EPA has the authority to regulate greenhouse gases (GHG) under the Clean Air Act. The Court stated that "EPA can avoid taking further action only if it determines that greenhouse gases do not contribute to climate change or if it provides some reasonable explanation as to why it cannot or will not exercise its discretion to determine whether they do." The Bush administration ensured that a response to the ruling would be delayed until the following administration, and it wasn't until December 2009 that the EPA issued a GHG scientific endangerment finding, the legal precursor to regulation. EPA subsequently announced GHG regulations for certain vehicles and stationary sources. Meanwhile, Congressional Republicans have pushed legislation that would take the unprecedented step of repealing the EPA's scientific finding and prohibit the agency from "promulgat[ing] any regulation concerning, take action related to, or take into consideration the emission of a greenhouse gas to address climate change." 76% Of Total Guests Were Opponents Of GHG Regulation. Media Matters examined TV news coverage that included elected officials, members of advocacy groups, business leaders, pundits, and others discussing EPA regulation of greenhouse gases. Of these appearances, 152 out of 199 -- over 76% -- opposed regulation. The three outlets that hosted the greatest number of guests, Fox News (FNC), Fox Business (FBN), and CNBC, all featured opponents of GHG regulation at least four times more often than supporters. 81% Of Fox Guests And 83% of Fox Business Guests Opposed GHG Regulation. Fox News hosted 52 guests who criticized the EPA's decision to regulate greenhouse gases. In that same period they featured only 10 supporters and two guests who took a neutral stance. Fox Business hosted opponents 65 times, compared to seven appearances by supporters. MSNBC hosted four times more supporters of EPA's action than opponents, but had far fewer guests commenting on the issue than did Fox. Coverage by CNN, ABC, NBC, And CBS Relied Less On Opinionated Guests. As the chart shows, CNN and broadcasts on network television (nightly news and/or Sunday shows) were far less reliant on outside opinions in their coverage, often featuring straight news reports without live interviews with guests. However, Fox Broadcasting Co.'s Fox News Sunday hosted over three times more opponents than supporters of GHG regulation with more total guests commenting on the issue than the other broadcast networks and CNN combined. Cable News Outlets Hosted Republicans 30 Times, Democrats 5 Times. Of the 35 cable news appearances by elected officials who discussed EPA regulation of greenhouse gases, 30 were Republicans and five were Democrats. The only cable network that hosted more Democrats than Republicans was MSNBC. CNBC featured eight elected officials, all of whom were Republicans. Democrats Hosted By Fox News And Fox Business Opposed GHG Regulation. Fox News and Fox Business each hosted one Democrat who discussed EPA regulation of greenhouse gases during their appearance. However, those Democrats, then-Sen. Evan Bayh (D-IN) and then-Gov. Joe Manchin (D-WV) both expressed opposition to EPA's GHG rules. By contrast, every Republican who discussed the regulations on cable news opposed the EPA's actions. The Elected Officials Who Opposed EPA Regs In TV Appearances Received Over $3 Million From Fossil Fuel Companies. According to our analysis, 26 elected officials and candidates for office have discussed EPA regulation of greenhouse gases in TV appearances since December 2009. Of those 26, 23 opposed the EPA's action on greenhouse gases. These 23 politicians collectively received $3,026,041 from companies that generate, produce, or refine fossil fuels from 2007-2010. The three elected officials who supported the EPA received a total of $202,000. On average, the opponents of EPA's regulation of greenhouse gases received approximately $131,500 from fossil fuel companies, while the supporters received, on average, about $67,300. 76% Of Guests Representing Advocacy Groups Opposed EPA Regulations. Of the television appearances by guests who discussed the GHG regulations, 29 were identified as representatives of advocacy groups. For around 76 percent of those appearances -- 22 of the 29 -- the guest opposed EPA regulation of greenhouse gases. Cato's Patrick Michaels Was The Only Climate Scientist Hosted In TV Coverage Of EPA Regulations. Of the TV guests who discussed EPA's GHG regulations over 17 months, only one, Patrick Michaels of the Cato Institute, has a background in climate science. Michaels appeared twice on Fox News' Your World with Neil Cavuto and spoke in opposition to EPA GHG rules. Michaels holds a Ph.D. in ecological climatology and was a professor of environmental sciences at the University of Virginia. ZAKARIA: Right, but people say that you're advocating also for the current petroleum-based industry to stand pat, to stay as it is, and that a lot of your research is funded by these industries. ZAKARIA: Well, can I ask you what percentage of your work is funded by the petroleum industry? The following graph shows the monthly number of guest appearances covered in this report and is followed by a timeline of major events related to the EPA's greenhouse gas regulations. 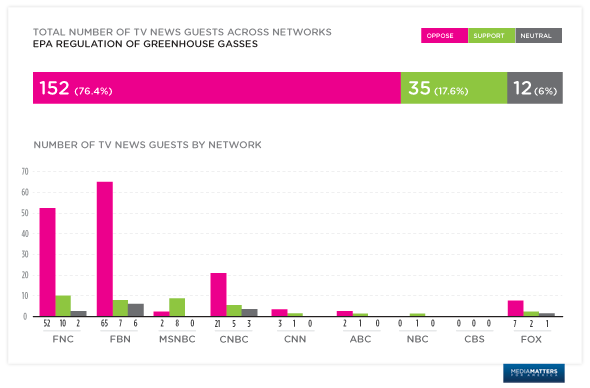 This report analyzes guests who appeared on Fox News, Fox Business Network, MSNBC, CNBC and CNN, and on the nightly and/or Sunday news programs of ABC, CBS, NBC, or Fox Broadcasting Co. between December 1, 2009 and April 30, 2011 (inclusive) and who discussed the EPA's role in regulating greenhouse gas emissions during their appearance. For the primetime shows on Fox News, Fox Business, and MSNBC; CNN's coverage; ABC, CBS, NBC, and Fox Broadcasting Co.'s nightly and/or Sunday news programs, we searched the Nexis database for "epa and greenhouse or carbon or climate change or global warming or co2" to identify relevant guest appearances. For shows that did not appear in Nexis, we searched closed captioning transcripts from our video archive for "carbon," "greenhouse," and variations of the term "epa." Anchors, hosts and correspondents on the show were not included, but paid contributors and hosts of other shows brought on to express an opinion were included. 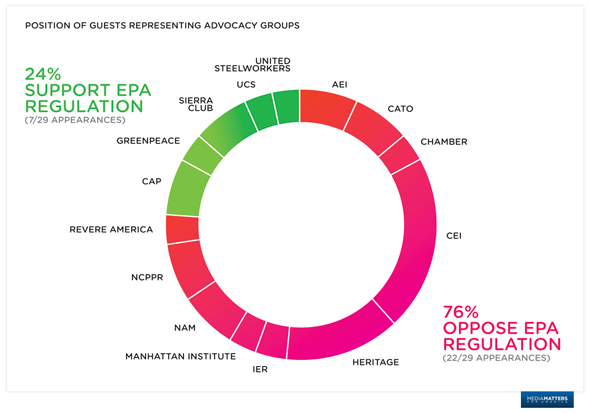 Guests who expressed support for the EPA's authority to regulate greenhouse gases were labeled as supporting the EPA regulations, while those who expressed opposition to the regulations or questioned the EPA's authority over greenhouse gas emissions were labeled as opposing the EPA regulations. Guests who did not express a position for or against the regulations were labeled as neutral. Political donations from fossil fuel interests were calculated based upon totals reported by the Center for Responsive Politics since 2007. For non-federal office holders, financial disclosure forms from each state were consulted. Only donations from companies that actively produce, refine, or generate power from natural gas, oil, or coal were included. The total for each candidate only includes donations from companies' PACs, not individual employees, though donations from employee PACs were included.